Epic dimensions. 5,000 years ago, human civilization was getting off the ground in Mesopotamia. At some point, the early human pioneers decided to use pictures as letters and human writing was invented. Ox became aleph, which became alpha, which turned into literature, which finally turned into blogging. At around the same time that the Mesopotamian people invented the direct precursor of modern day tweets and text messages, rare genetic variants started spreading through the human population. In fact, all the rare variation that we see in humans today, had probably not been present prior to the chiseling of the first human words. Olive trees. Human evolution virtually exploded 5,000-10,000 years ago, which is reflected in our genetic make-up. In a Nature paper earlier this year, Fu and collaborators found that the vast majority of rare variation and deleterious variation in the human genome is relatively recent. The Sisters Olive Trees of Noah in Lebanon are likely to be 5,000-6,000 years old and are considered some of the oldest trees in the world. These trees have virtually witnessed the time span in which most of the deleterious rare variation in the human genome occurred. If this rare, deleterious genetic variation is considered to be contributory to disease, genetic predisposition to many human disorders appears to be a relatively recent event. Rare variants today. We have recently spent quite some time looking into rare variants in the exomes of child-parent trios. Even though we have emphasized earlier this year that the role of de novo mutations is probably still underestimated, the fraction of patients with epileptic encephalopathies carrying explanatory de novo mutations is much less than initially expected. There is a high frequency of “exome failures”, i.e. patient-parent trios, where no explanatory de novo mutation could be identified. If we look at the current literature, these exome failures actually appear to be the rule, not the exception. More than 80% of patients with epileptic encephalopathies, autism or intellectual disability are negative for de novo mutations. This leaves ample room for inherited risk factors. 10 rare for each monogenic variant. A few years ago when scientists were skeptical about the role of microdeletions including 15q13.3 in epilepsy, a common defense for their importance in human disease referred to the relative high frequency of these variants compared to monogenic disorders. In fact, the contribution of these rare variants on population level probably outnumbers the role of monogenic diseases by a factor of 10 and more. Accordingly, the strong focus on monogenic variants in the analysis of exome data is actually a step backwards for a general acceptance of rare variants that we had achieved with copy number variations. Recognizing that much genomic data does not necessarily guarantee monogenic disorders might makes us now reconsider working on paradigms to investigate inherited variation. Babysteps. We are currently in the process of sifting through lots of rare variation in trio exomes, trying to understand the properties of these variants. For example, in a recent analysis of some of our SCN1A-negative Dravet trios, we found a remarkable stability of transmitted rare variants present in 1% or less in various databases. Using the same filter algorithm for all trios, we found that approximately 150-200 rare variants are transmitted from either parent to the child. This is a remarkably constant finding that can be used as a quality check to see whether a given child is actually related to his or her parents. In the case of DRA8 (Figure), we might deal with adoption or some other artifact that we’re not aware of yet. This plot shows the number of rare variants transmitted from each parent to the child in a sample of patient-parents trios. Rare variants were defined as less than 1% in the 1000 Genomes project and Exome Variant server with sufficient read depth (>15) and absent from segmental duplication. 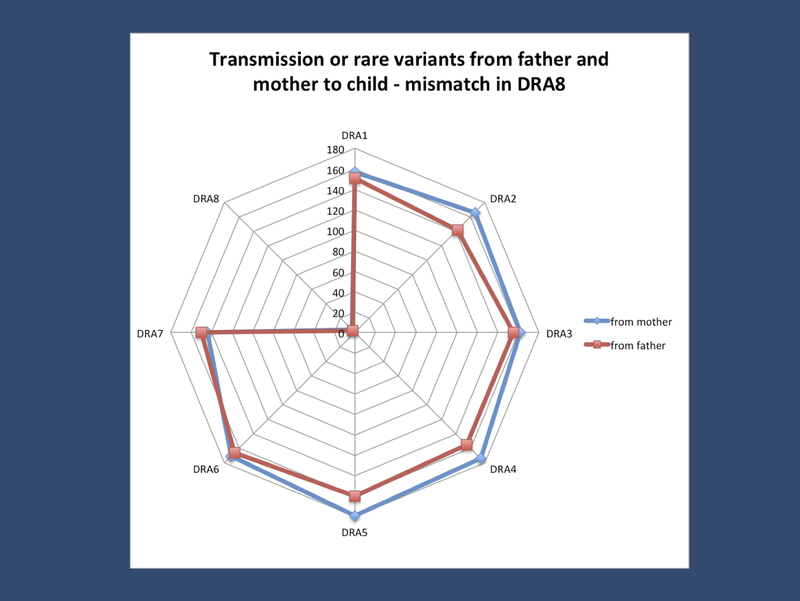 The number of rare variants transmitted from father and mother appears to be quite stable between trios – with the exception of DRA8, where the proband does not seem to be the parents’ child. The future of rare variants. The temporary success of de novo mutation studies using exome data might distract from the fact that rare genetic variants were initially considered to be a main source of genetic morbidity, explaining some of the missing heritability. There is currently a need to better understand rare variation and to develop useful tests to assess their relevance in exome data. However, with increasing sample sizes and a better understanding of the behavior of rare variants, we might be able to push past purely monogenic disorders and understand some of the complexity of human disease. This entry was posted in 2013, Bioinformatics, Epileptic encephalopathy, EuroEPINOMICS and tagged autism, complex genetic disorders, Dravet Syndrome, exome, human evolution, intellectual disability, Mesopotamia, missing heritability, olive, olive tree, rare variants, science, SCN1A, The Sisters Olive Trees of Noah. Bookmark the permalink.